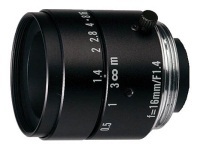 The 16 mm focal length is ideal for many projects. Image distortion is minimal – just .8% for a 1/2 size sensor – making it good for pattern match and OCV applications. And a system having a 16 mm lens will be more compact than one having a 25 or 35 mm lens.